The Legends are in 1870 to fix the anachronism which happens to be at P.T. Barnum's fledgling circus. However, Nate and Ray accidentally free a saber-toothed tiger, creating a bigger problem. 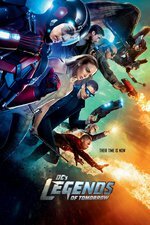 *AV Culb - The Legends Of Tomorrow join Barnum’s circus in another delightful episode. *IGN - The Adventures of P.T. Barnum and the Incredible Man of Steel. *Den of Geek - A little wariness and a little historical context for a mixed episode of Legends of Tomorrow. That was almost nonstop fun, with the only 'stop' being Nate - he's just too dumb, even for that team. Like, Ray sneezing and accidentally enlarging the saber-toothed tiger? Classic. The brawl with Mick, Stein and a bunch of clowns? Brilliant. Sarah vs. Time Cop? It's nice that she has a foil now. Nate just spilling who they are to PT Barnum? Good grief, they need to kennel that guy. However, Nate and Ray accidentally free a saber-toothed tiger, creating a bigger problem. So I guess that was supposed to be B'wanna Beast in Barnum's circus? Okay, not the way I would have played him--I would have been curious to see a proper (ha!) Beast interact with Vixen, but I'm not in charge of multiple superhero TV shows. I liked the idea of the sabertooth tiger but the special effects were just so bad that it was hard to watch. I was really that when Sara and the time cop went somewhere private they would have gotten into something a bit more personal than a discussion about the upcoming threat to time. I still don't know who the big bad of the season is going to be. I haven't really been keeping up with the news and gossip sites, and I didn't recognize the names they've dropped so far, but maybe my comics knowledge is just a bit out of date. Well crap. It seems one of the regulars is leaving the show. And not one of the ones we wouldn't mind see going. How is spoiler going to work under the current plot circumstances? awww. but good for him! I really like him in whatever he's in, and he's certainly one of the best part of the show. this was a fun episode, I didn't even mind drunk idiot Nate, but he could've used some more sense-slapping. I'm looking forward to the big-bad too, and human made of out water! The "Thomas Andrews should be shot" gag was great. Indeed, the Garber joke about the Titanic was one of the highlights. I was confused that they have Gideon say something vaguely complimentary about Barnum and then turn him into a would-be slaver. I loved the Garber Titanic joke compounded by Billy Zane being PT Barnum. But the idiotic behavior by Nate, Ray and Jax in the saloon was just too much to bear.